I wrote recently about letting go of expectations, surrendering into the reality of experience, rather than controlling it, measuring it, predicting it, manipulating it to meet what you want to find. I can practice this on the mat and I can practice it off the mat. Wherever is appropriate. At the weekend I went to a performance of Persian and Cretan music. To be honest, although the santur player was the top billing I was there more for the Cretan stuff. I didn’t even know what a santur was. Expectations met in the sense that I loved the Cretan music as fully as I thought I would: wonderfully evocative and nostalgic, a bitter-sweet transportation to other times and places in other company. I wanted to sing and dance. I did both in my head at least! 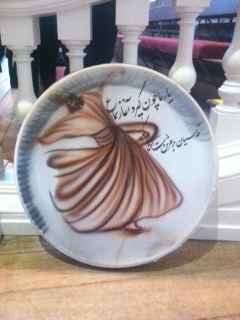 But the Persian music too was something else! The whole structure of the music was so foreign to me. Sometimes the direction of the music was obvious with insistent drumming and syncopated rhythms urging the musicians on. At other times the melody was lost to my ears. No matter. I surrendered myself to the novelty, the unpredictability, the mysterious modes and unfamiliar harmonics. A joyful meandering of sound. And I just floated with it, letting the sounds wash over me and through me. It filled me up. I felt bouyant. It didn’t matter where it was going, and I gave no consideration of when it would end or how. I couldn’t control it, I could only let it unroll as it would. I received it as the gift it was, delighting in it, attending closely to it, feeling the pulse of it. Yes, I let go of expectations. And, yes, it felt wonderful. So I tried to bring this experience back to my mat — sometimes life informs yoga. I’m not fussy about the directions the arrows point in, it’s all ‘yoga’ in some sense of the word. I set my intention, keeping in mind the expression ‘kindly awareness’ that my meditation teacher often used. I scribbled a few phrases in my journal while the class was gathering: make no demands other than where the breath leads. seek nothing. feel muscles, explore movements. be graceful in transitions, be humble in resting, be grateful for everything. And this was how it went. Perhaps the writing of it sealed these thoughts in my heart. My practice seemed somehow looser. My concentration that’s recently been wavering, to put it kindly (or ‘all over the shop’ to be more frank), was more controlled, more interested somehow. I feel that if some super-being were to have hit the pause button at any point during practice and asked me what was going on, I could have articulated quite well where my thoughts were or what sensations I was exploring in my body. Beautifully inspiring, babycrow. Music is… playing with the mystery of sound. It’s all yoga. Thank you for sharing the journey. thank you! I certainly felt inspired myself 🙂 I feel as though I’ve just started hearing – literally and metaphorically.